Recently I wrote a blog about The Battle of Beecher’s Island. There were some interesting stories about this battle that I did not include. I’ve listed them here. 1) The man the battle was named after had several other family members who were in the public light. Lieutenant Beecher was the nephew of Abolitionist Henry Ward Beecher. He was also the nephew of Harriet Beecher Stowe, known for writing Uncle Tom’s Cabin. Lt. Beecher’s father was Reverend Charles Beecher, a well-known evangelist of his time. Only a short time before the death of the Lieutenant, the family had lost his two younger sisters in a drowning accident. Beecher’s last words before he expired were of concern for his mother. 2) The indian chief refused to lead his men because he was afraid he would die. After he was talked into leading the second charge, he died. Also he was not a chief. Roman Nose had initially refused to join the fight at Beecher’s Island because the night before he had unwittingly violated a taboo. As a guest at a Sioux Chief’s lodge, he had been served a piece of meat taken from the fire by an iron fork. He believed that the iron would draw bullets. His men talked him into leading the second charge, where he was shot and killed. Contrary to many reports, Roman Nose was not a chief. He was a warrior with the reputation of being a fearless battle leader. The Cheyenne had camped outside of Ft. Laramie and Roman Nose observed the soldiers as they drilled. Roman Nose copied many of their tactics. He was a large impressive individual, 6 foot 3 inches tall. His given name was Sautie (the bat). The soldiers nicknamed him “Roman Nose” because of his large hook nose. He took it as a compliment and adopted the name in English and in Cheyenne (Woqini). 3) One solider fought half the battle with an arrowhead in his skull. Early in the battle, Scout Frank Harrington was struck in the forehead by an arrow. He asked another scout to pull the arrow from his head. The arrow shaft came loose from the arrowhead. They could not dislodge the arrowhead. Harrington fought on with the flint arrow point sticking from his forehead. In the heat of the battle an Indian musket ball struck the arrowhead and dislodged it. Harrington survived and his wound eventually healed. 4) A rattlesnake almost ended a rescue attempt, but was stopped with chewing tobacco. Forsyth knew they were in a bad spot. He selected Jack Stilwell and an older frontiers man, Pierre Trudeau, to sneak through the Indian lines under the cover of darkness and go to Ft. Wallace for help. The next day they hid in a buffalo wallow to await darkness again. A group of Indians rode near. The two Scouts flattened against the wall of the wallow and waited. The Indians stopped nearby. A large rattlesnake slithered through the grass and dropped into the wallow. It crawled towards the Scouts. Stilwell silently spit a big wad of tobacco juice right onto the snake’s head. The snake made a hasty retreat. Finally the unsuspecting Indians moved on. 5) The youngest fighter was only 16. Jack Stilwell was 19, but the youngest Scout was a 16-year-old Jewish boy from New York City. He asked to join the Scouts and was turned down at first, but Forsyth relented and let him join them. His name was Sigmund Schlesinger. Forsyth wrote later that he preformed with great bravery. Schlesinger went home to New York City and told the story of The Battle of Beecher’s Island many times. Church was over and the group of friends were looking for something to do that Sunday afternoon. They were teenagers. Beecher’s Island, Colorado, made a nice outing. Just across the Kansas/Colorado state line, it was about twenty-five miles from St. Francis, Kansas, their hometown. They loaded up the old Dodge touring car and a Model T Ford. 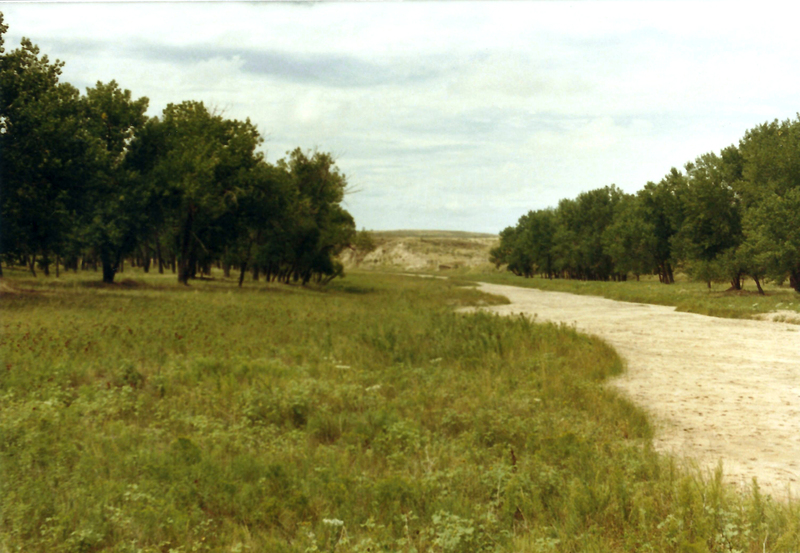 For a group of teenagers in the late 1920’s, it was an enjoyable ride across the Kansas/Colorado prairie. They still wore their Sunday-go-to-church clothes. The group’s destination was a small park on the Arikaree branch of the Republican River. It was named Beecher’s Island in honor of Lieutenant Beecher, the army officer that lost his life there. This area is the site of a battle between Frontier Scouts and a large Indian force. Like most streams in that dry country, the Arikaree is a wide, shallow stream, with sandy banks and bottom. It was subject to flooding in the winter and spring months, drying down to a mere trickle between a few pools of water in the summer and fall. Thirty years after the 1868 battle, some Scouts returned to mark the site and start an annual September reunion of the survivors. The survivors have been gone for many years, but the annual reunion is still held in September each year. The September 24, 1903 issue of the St. Francis newspaper reported that four of the surviving Scouts attended the annual reunion. Some of the descendants of the Scouts have attended in modern times. I recall my family attending the get-togethers when I was a child. I think I remember attending church services in an old round-topped assembly hall building. The grounds form a park belonging to the Beecher’s Island Association. An Obelisk with the names of the Scouts on it commemorates the battle. The bottom of the Obelisk on the grounds. The Scouts are named on the other sides. After many floods, only a small vestige of the original island remained as my mother and her teenage friends walked along the sandy shore that day. She worried about scuffing and damage to her dress-up shoes. Her high heels sank into the sand and one struck something. She stopped to take the shoes off. A friend suggested that she might want to check out what the heel had touched. They dug in the heel print and retrieved a musket ball. Since the Army Scouts were shooting .52 cal. Spencer rifles and .44 cal. Colt revolvers, the much larger caliber lead ball would have came from an Indian musket. The ball had a distinct crease in it. It appeared to have struck a saddle ring or a belt buckle. Through the years my mother kept the lead ball in a small box, with arrowheads she had found in a former buffalo wallow on our Cheyenne County, Kansas farm. She stored the box in a drawer of her sewing machine cabinet. The story of the musket ball intrigued me through the years. It nourished my interest in Beecher’s Island and the western frontier. 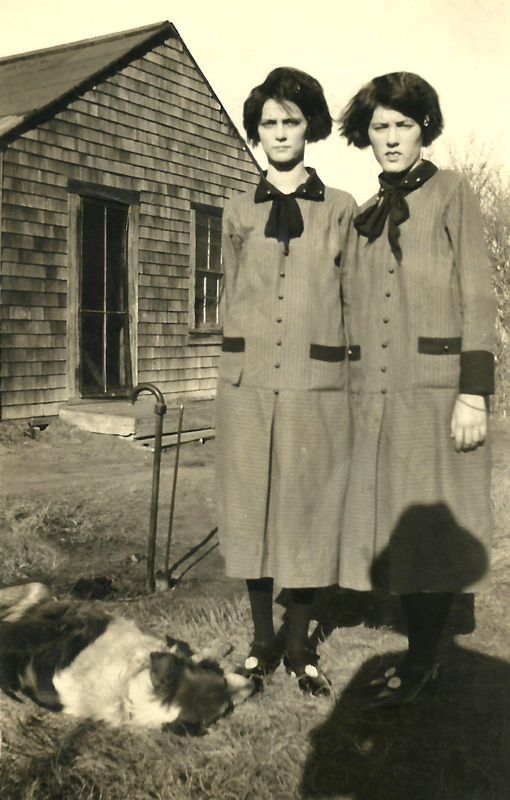 Twin sisters in the late 1920’s. My mother is on the right. She was struck down by cancer in mid-life. Her fraternal twin lived into her 80’s. During the Civil War, westward expansion slowed. The Indian Tribes of the plains took advantage of the lull and formed alliances with former enemy tribes. Together they vowed to stop the migration of the whites. The Indians attacked the new settlers and railroad crews with a savage vengeance not seen before the Civil War. The regular Army had difficulty in mobilizing and pursuing the raiding Indians. A large force of soldiers and the required support force just couldn’t move fast enough to catch the raiders. General Sheridan authorized the formation of a special strike force. A well-armed group of 50 civilian frontiersmen under the command of regular army officers was formed. The Scouts were issued Spencer seven shot repeating rifles, Colt six shot revolvers, blankets, horse gear, and other supplies. Major George A. Forsyth of General Sheridan’s staff was placed in charge. Forsyth had been on Sheridan’s staff since the last year of the Civil War. In fact, Major George Forsyth made the famous ride to Winchester with Sheridan. Forsyth had been breveted a colonel for bravery during the Civil War, giving him the right to the title but not the pay. Second in command was Lieutenant Fred H. Beecher. Beecher also had a Civil War background, having suffered a leg wound at Gettysburg that left him with a limp. The surgeon assigned to the Scout group was Dr. J. H. Mooers, a former major and surgeon in the Union army. Many of the civilian Scouts had been in the Union or Confederate service. Scout William H. H. McCall had been a brevet brigadier general in the Union army. With the exception of one, all the Scouts had military or frontier experience. Forsyth picked up 30 Scouts at Ft. Harker and proceeded to Ft. Hays. At Ft. Hays he signed on 20 more men to finish his allotment of 50 Scouts. Among the Scouts was a former army Scout and interpreter named Sharpe Grover. Grover had married a Sioux woman and lived for a time with the Indians. He was still recuperating from a wound in his back that he had received a month earlier in a fight with hostile Indians. The Scouts traveled west and north to Beaver Creek and found much old sign of a large group of Indians. Since the sign was old, they returned to Ft. Wallace and Sheridan City, the temporary end of the Kansas Pacific Railroad, then under construction. They arrived at Ft. Wallace on the evening of September 5th and found that a wagon train had been attacked. Two teamsters had been killed. The surviving teamsters estimated the raiding party to be about 20 strong. Forsyth drew rations and struck out at daylight on September 6th, to track the Indians. The Indian raiders broke up into smaller groups to foil attempts to follow them. Grover and Forsyth suspected the move, picked a track, and kept following. They would lose the track and circle around the area until they found it again. The process took several days. 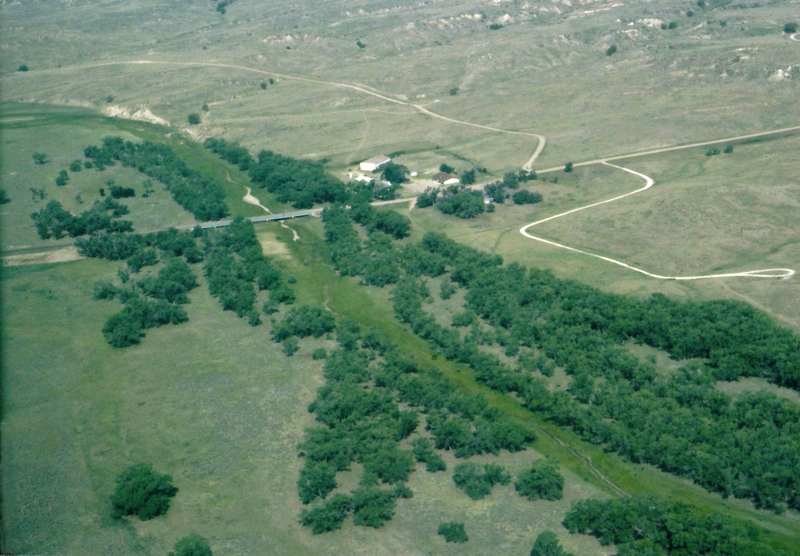 They crossed the South Fork of the Republican in the proximity of the modern day Kansas/Colorado state line. On the north side of the river they found signs of much larger numbers. In fact, they knew they had found a large village on the move. On September 16, they stopped early to camp in a large open valley on the south side of the Arikaree River, a tributary of the Republican River. The valley had good grass for the horses and pack mules, and the stream had fresh water.. There was a small island in the stream near the camp. Forsyth later described the island as about sixty yards long and thirty yards wide. It was covered by grass and brush. A lone small cottonwood tree was growing at the upstream end. The island was about three to four feet higher than the stream bed. I took this picture on a flyover of Beecher’s Island area heading west about 20 years ago. The island would have been just past the left end of the modern day bridge. On the right is the Association grounds. At the time of the battle there were no trees excepting the lone cottonwood on the island. Floods have changed that and obliterated the island. The Scouts had not seen an Indian, but suspected they were being watched. They were indeed being watched. A short distance upstream, around a bend the Indians had an ambush set up. By stopping early the Scouts had unwittingly saved themselves. The frustrated Indians went back to their camp and considered their next move. The large Indian force, later estimated from 500 to 1,000 strong, was made up of North and Southern Cheyenne, Sioux, and Arapahoe. While the chiefs debated the next move, a group of young braves anxious to get at the hated whites and demonstrate their warrior skills, made their own plans. A small group of mounted Indians struck just at daylight, rattling dry hides and yelling in an attempt to stampede the horses. However, thanks to their experience and military know-how, the Scouts had their mounts well secured and many of the Scouts were up and ready for trouble. Only six horses were lost. Forsyth ordered the men to secure their mounts, stand their ground and return fire. After a short skirmish the Indians retreated. It was soon evident that a larger force was assembling around the battleground. Indians came into view, upstream, across the river and on the grassy plain in front. Only the downriver valley, the way the Scouts came in the night before, was left open as the Indians closed in. Forsyth, Grover, and McCall recognized it for what it was. A trap! Forsyth ordered the Scouts to retreat to the Island, tie their horses and start digging rifle pits. The Indians were both surprised and enraged at the maneuver. It took them time to regroup and organize their attack. During this time the Scouts distributed ammunition and continued digging rifle pits in the sand. Two Scouts were killed and several were wounded by Indian sharpshooters. Forsyth was the first to be wounded, taking a bullet in his right thigh as he directed the fortifications. He would receive two more wounds later on. The Scouts withering rifle fire stopped the first charge. The Indians regrouped and changed their tactics. The Indians were not prepared to attack a dug-in enemy with seven shot repeating rifles. According to George Bent, the educated son of fur trader William Bent and his wife Owl Woman, a Southern Cheyenne and daughter of a Cheyenne Medicine Man, the Indians were armed with bows and arrows, lances, assorted muskets, and rifles picked up off other battlefields. George and his brother Charles were in a Military Academy in St. Louis when the Civil War started. George enlisted in the Confederate Army at age 17 and fought at Wilson’s Creek, Pea Ridge and other battles before his capture. He was spotted in the prisoner camp in St. Louis. Members of the Bent family and his father’s political friends obtained his release. He went to Westport, joined a wagon train and returned home to Bent’s Fort. He said he had not been home in 10 years. Once there, George Bent embraced his mother’s Indian heritage and lived the rest of his life with the Cheyenne. There were two renegade white men present with the Indians at Beecher’s Island. Many would later claim that George was also in the Beecher’s Island fight. He was in other fights, but he never admitted to being at Beecher’s Island. However, he was able to give a good description of the battle from the Indians’ viewpoint. In my opinion, Forsyth and Bent give the most reliable accounts of the battle. Other writers of the period seem to use the bravado dime novel style that was common at that time. The Indians regrouped and prepared for a full-fledged charge to overrun the island. Roman Nose, a Cheyenne Dog Soldier War Chief, was persuaded to lead the charge. He had refused to join the fight previously because the night before he had unwittingly violated a taboo. As a guest at a Sioux Chief’s lodge, he had been served a piece of meat taken from the fire by an iron fork. He believed that the iron would draw bullets. The Indians posted rifles on the banks to keep the Scouts down in their rifle pits. A mounted force of several hundred Indians led by Roman Nose and another chief approached in a headlong charge from the downriver side of the island. They again intended to run full tilt over the Scouts. The entrenched riflemen calmly shot down line after line of charging Indians. At the last second the charge broke and skirted around both sides of the Island. Roman Nose and his horse were both downed at this time. The other Indian leader had been killed early in the charge. Nineteen-year-old Jack Stillwell was credited with killing Roman Nose. The Indians regrouped and charged again with large losses. By this time, Lieutenant Beecher had been killed and five more Scouts were dead with Dr. Mooers mortally wounded. Fourteen other Scouts were also wounded. All of the horses had been killed by the Indians. The Scouts were out of rations and later resorted to eating horse meat and one coyote that wandered too close. Forsyth prepared to send Scouts Stillwell and Trudeau out on foot to Fort Wallace for help. The 110 mile journey took them four days and nights. On September 19, it appeared that the Indians were withdrawing. Forsyth sent two more men out after dark with a dispatch to Ft. Wallace. These Scouts, Donovan and Pliley, struck south and after two days intersected the Ft. Wallace to Denver road. They soon made contact along the road with Col. Carpenter of the Tenth Calvary and his troop of “Buffalo Soldiers” as the African American troops were called by the Indians. The Colonel sent a messenger on to Ft. Wallace and proceeded at once to assist the Scouts. The Scouts spent a total of nine days on the island. Of 51 Scouts, 5 were killed and 15 wounded. 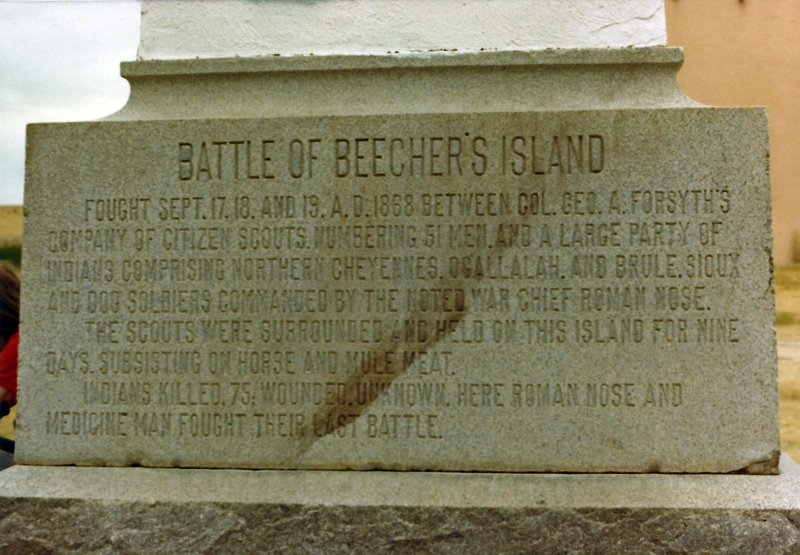 The island was named in honor of the fallen Lt. Beecher. It was later determined 75 Indians were killed and hundreds wounded. Years later a Sioux Indian, talking to Forsyth, confirmed the number killed at 75. The Indian then opened his shirt and displayed the scars of his own wounds from the Beecher’s Island battle. Beecher’s Island. My mother visited it before me, and I have visited there several times as well along the Sundown Trail. Looking west from the location of the island. The bluff in the background is mentioned by Forsyth as the one where the squaws and children gathered to cheer the warriors on. *Technical note: The arms of the Scouts have been called rifles and the next writer will call them carbines. Forsyth called the Scout’s shoulder arms rifles. He also said they slung them across their back… The longer barrel rifles had sling mounts, carbines have saddle rings. I take Forsyth at his word on this one. Also, in comparing my mother’s musket ball, I used .52 caliber to compare to the Spencers because that is the actual bullet size. Normally they designate the Spencer by the cartridge case size of .56 caliber. Thought I should explain, before I get called on it. My family’s historical comments and local lore. Letters and papers of George A. Forsyth from the Manuscripts Collection, Stephen H. Hart Library, Colorado Historical Society, Denver CO and The Colorado State Archives. The Story of the Soldier, by George A. Forsyth, published by D. Appleton and Company, 1900. The Beecher Island Battle Ground Memorial Association.